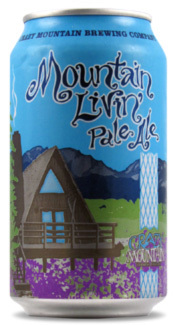 Crazy Mountain Brewing is a can-only brewery that hails from Vail Valley, Colorado and has just recently opened up to limited nation-wide distributing.Being in one of the select few states to get their beer, this was my first entry into the beers that make up Crazy Mountain. This was pretty much what I would normally expect from an American pale ale. Sweet yet dry and hoppy. Appearance: Poured a bright amber color with incredible clarity. The head was two-fingers of off-white rocky goodness that left lacing that would even grandma would be proud of. Head settled down into a thick film that lasted right to the end. Smell: Not a whole lot happening in the nose. The smell is bready and sweet with hop notes of grapefruit and an grass-like earthiness. It’s a very soft, clean smelling beer. Initial Taste: Up front there is a caramel, malt sweetness that sets the baseline for the hops. The hops deliver a medium bitterness that sticks to the side of your mouth and doesn’t let go. Citrusy and earthy the hops are a welcome addition to a pale ale that is a little on the sweet side. The finish would be sweet if it wasn’t for that lingering bitterness that helps to dry things out and clear the palate for the next sip. Little to no aftertaste. Thoughts: Crazy Mountain Brewing is a can-only brewery that hails from Vail Valley, Colorado and has just recently opened up to limited nation-wide distributing.Being in one of the select few states to get their beer, this was my first entry into the beers that make up Crazy Mountain. This was pretty much what I would normally expect from an American pale ale. Sweet yet dry and hoppy. Making this a good candidate for a hot weather beer. The only problem I had with this beer is that it was a bit too middle of the road. There wasn’t anything that stood out for me. Nothing at least that would make me choose this over another good APA. But it was still a good pale ale and the fact that it comes in a can is very forward thinking and increases it’s chances of being chosen for that outdoor party or event. Overall this is a good pale ale that is very easy to drink. And it comes in a CAN… did I mention how cool that was? When it comes to your town give it a try and let us know what you thought. Cheers. Next: Video game mogul to start microbeer web site.